Near the end of the Apollo space program, NASA officials were looking at the future of the American space program. At that time, the rockets used to place astronauts and equipment in outer space were one-shot disposable rockets. What they needed was a reliable, but less expensive, rocket, perhaps one that was reusable. The idea of a reusable "space shuttle" that could launch like a rocket but deliver and land like an airplane was appealing and would be a great technical achievement. 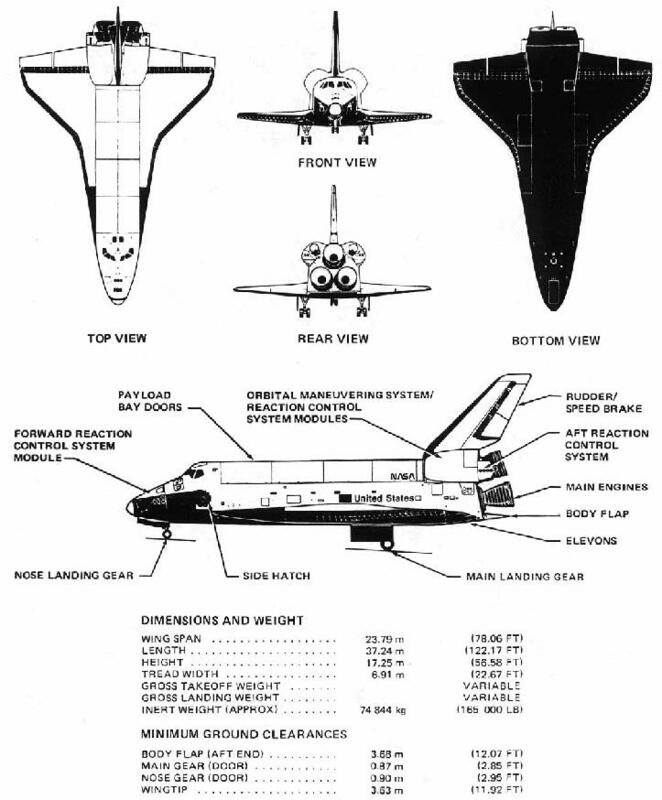 NASA began design, cost and engineering studies on a space shuttle. Many aerospace companies also explored the concepts. 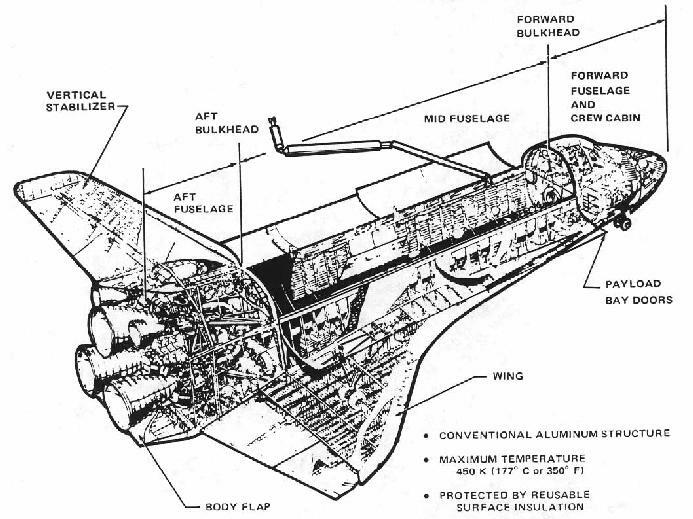 The concepts varied from a reusable, manned booster concept (shown above) to a shuttle lifted by solid rockets. In 1972, President Nixon announced that NASA would develop a reusable space shuttle or space transportation system (STS). NASA decided that the shuttle would consist of an orbiter attached to solid rocket boosters and an external fuel tank because this design was considered safer and more cost effective. 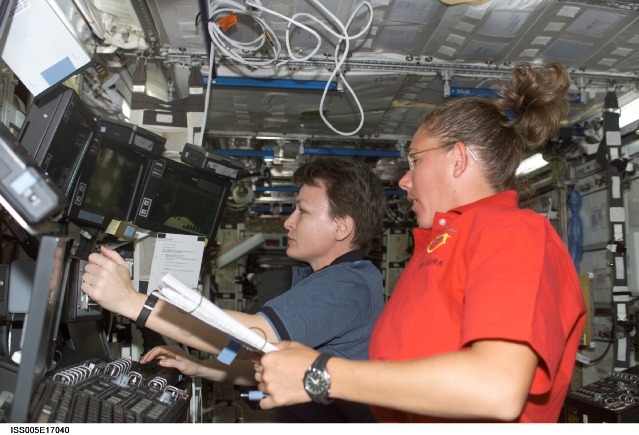 NASA awarded the prime contract to Rockwell International. At that time, spacecraft used ablative heat shields that would burn away as the spacecraft re-entered the Earth's atmosphere. However, to be reusable, a different strategy would have to be used. The designers of the space shuttle came up with an idea to cover the space shuttle with many insulating ceramic tiles that could absorb the heat of re-entry without harming the astronauts. Remember that the shuttle was to fly like a plane, more like a glider, when it landed. A working orbiter was built to test the aerodynamic design, but not to go into outer space. The orbiter was called the Enterprise after the "Star Trek" starship. The Enterprise flew numerous flight and landing tests, where it was launched from a Boeing 747 and glided to a landing at Edwards Air Force Base in California. Finally, after many years of construction and testing (i.e. orbiter, main engines, external fuel tank, solid rocket boosters), the shuttle was ready to fly. Four shuttles were made (Columbia, Discovery, Atlantis, Challenger). 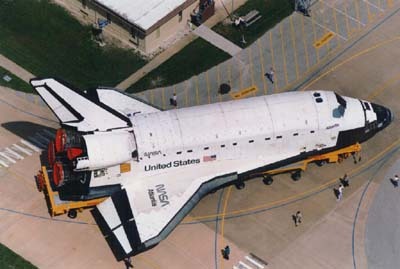 The first flight was in 1980 with the space shuttle Columbia, piloted by astronauts John Young and Robert Crippen. Columbia performed well and several flights of the other shuttles were made. In 1986, the shuttle Challenger was destroyed in flight when a flame from a leaky joint on one of the solid rocket boosters ignited the fuel in the external fuel tank. The Challenger exploded and the entire crew was lost. The shuttle program was suspended for several years, while the reasons for the disaster were investigated and corrected. After several years, the space shuttle flew again and a new shuttle, Endeavour, was built to replace Challenger in the shuttle fleet. 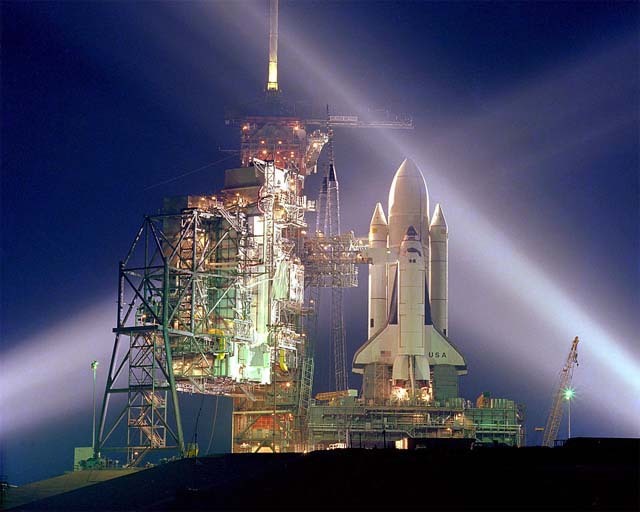 To date, the space shuttles have flown about one-fourth of their expected lifetime (each shuttle was designed for 100 missions) and have undergone many refits and design changes to make them safer and to carry heavier payloads into orbit. In 2003, Columbia was lost due to a impact by a piece of external tank foam on the port wing which produced a hole large enough for a burn through during re-entry. The Shuttle program has been halted for over a year and will restart with an extremely limited flight schedule and new safety constraints. A typical shuttle mission lasts seven to eight days, but can extend to as much as 14 days depending upon the objectives of the mission. The SRBs are solid rockets that provide most of the main force or thrust (71 percent) needed to lift the space shuttle off the launch pad. In addition, the SRBs support the entire weight of the space shuttle orbiter and fuel tank on the launch pad. Because the SRBs are solid rocket engines, once they are ignited, they cannot be shut down. Therefore, they are the last component to light at launch. The orbiter has three main engines located in the aft (back) fuselage (body of the spacecraft). Each engine is 14 feet (4.3 m) long, 7.5 feet (2. 3 m) in diameter at its widest point (the nozzle) and weighs about 6,700 lb (3039 kg). The main engines provide the remainder of the thrust (29 percent) to lift the shuttle off the pad and into orbit. The engines burn liquid hydrogen and liquid oxygen, which are stored in the external fuel tank (ET), at a ratio of 6:1. They draw liquid hydrogen and oxygen from the ET at an amazing rate equivalent to emptying a family swimming pool every 10 seconds! The fuel is partially burned in a pre-chamber to produce high pressure, hot gases that drive the turbopumps (fuel pumps). The fuel is then fully burned in the main combustion chamber and the exhaust gases (water vapor) leave the nozzle at approximately 6,000 mph (10,000 km/h). Each engine can generate between 170,000 and 213,000 lb (748,000 to 937,200 N) of thrust; the rate of thrust can be controlled from 65 percent to 109 percent maximum thrust. The engines are mounted on gimbals (round bearings) that control the direction of the exhaust, which controls the forward direction of the rocket. As mentioned above, the fuel for the main engines is stored in the external tank (ET). The ET is 158 ft (48 m) long and has a diameter of 27.6 ft (8.4 m). When empty, the ET weighs 78,100 lb (35, 425 kg). It holds about 1.6 million lb (719,000 kg) of propellant with a total volume of about 526,000 gallons (2 million liters). The ET is made of aluminum and aluminum composite materials. It has two separate tanks inside, the forward tank for oxygen and the aft tank for hydrogen, separated by an intertank region. Each tank has baffles to dampen the motion of fluid inside. Fluid flows from each tank through a 17 in. (43 cm) diameter feed line out of the ET through an umbilical line into the shuttle's main engines. Through these lines, oxygen can flow at a maximum rate of 17,600 gallons/min (66,600 l/min) and hydrogen can flow at a maximum rate of 47,400 gallons/min (179,000 l/min). 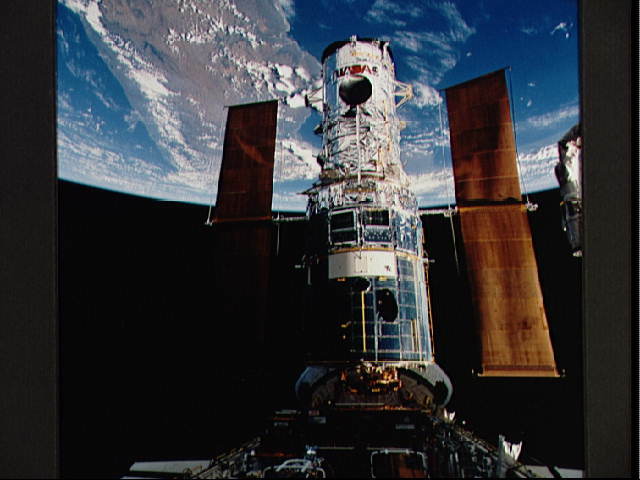 During the first few shuttle missions, the ET was painted white, but this was stopped to reduce the weight. The two orbital maneuvering systems' (OMS) engines are located in pods on the aft section of the orbiter, one on either side of the tail. These engines are used to place the shuttle into final orbit, to change the shuttle's position from one orbit to another, and to slow the shuttle down for re-entry. The OMS engines burn monomethyl hydrazine fuel (CH3NHNH2) and nitrogen tetroxide oxidizer (N2O4). Interestingly, when these two substances come in contact, they ignite and burn automatically (i.e., no spark required) in the absence of oxygen. The fuel and oxidizer are kept in separate tanks, each pressurized by helium. The helium is used to push the fluids through the fuel lines (i.e., no mechanical pump required). In each fuel line, there are two spring-loaded solenoid valves that close the lines. Pressurized nitrogen gas, from a small tank located near the engine, is used to open the valves and allow the fuel and oxidizer to flow into the combustion chamber of the engine. When the engines are shut off, the nitrogen goes from the valves into the fuel lines momentarily to flush the lines of any remaining fuel and oxidizer; this purge of the line prevents any unwanted explosions. During a single flight, there is enough nitrogen to open the valves and purge the lines 10 times! Either one or both of the OMS engines can fire, depending upon the orbital maneuver. Each OMS engine can produce 6,000 lb (26,400 N) of thrust. The OMS engines together can accelerate the shuttle by 2 ft/s2 (0.6 m/s2). 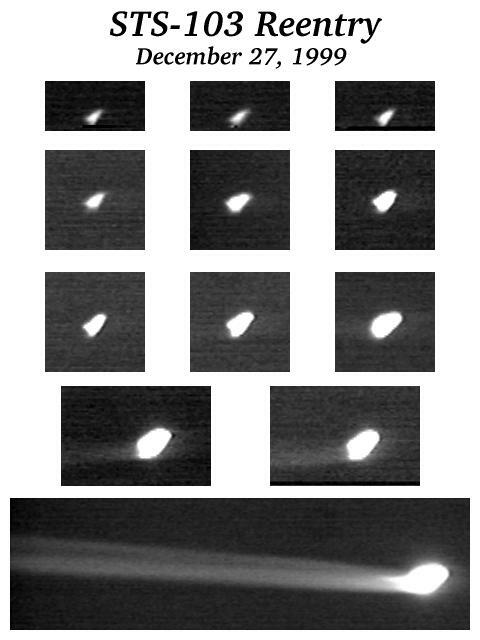 This acceleration can change the shuttle's velocity by as much as 1,000 ft/s (305 m/s). To place into orbit or to de-orbit takes about 100-500 ft/s (31-153 m/s) change in velocity. Orbital adjustments take about 2 ft/s (0.61 m/s) change in velocity. The engines can start and stop 1,000 times and have a total of 15 h burn time. T minus 31 s - the on-board computers take over the launch sequence. T minus 6.6 s - the shuttles main engines are ignited one at a time (0.12 s apart). The engines build up to more than 90 percent of their maximum thrust. T minus 3 s - shuttle main engines are in lift-off position. T minus 0 s -the SRBs are ignited and the shuttle lifts off the pad. T plus 20 s - the shuttle rolls right (180 degree roll, 78 degree pitch). T plus 60 s - shuttle engines are at maximum throttle. T plus 2 min - SRBs separate from the orbiter and fuel tank at an altitude of 28 miles (45 km). Main engines continue firing. Parachutes deploy from the SRBs. SRBs will land in the ocean (about 140 miles (225 km) off the coast of Florida. Ships will recover the SRBs and tow them back to Cape Canaveral for processing and re-use. 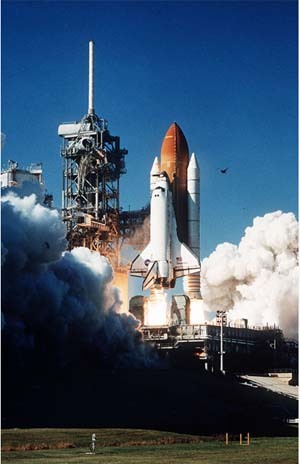 T plus 7.7 min - main engines throttled down to keep acceleration below 3g's so that the shuttle does not break apart. T plus 8.5 min - main engines shut down. T plus 9 min - ET separates from the orbiter. The ET will burn up upon re-entry. T plus 10.5 min - OMS engines fire to place you in a low orbit. T plus 45 min - OMS engines fire again to place you in a higher, circular orbit (about 250 miles/400 km). 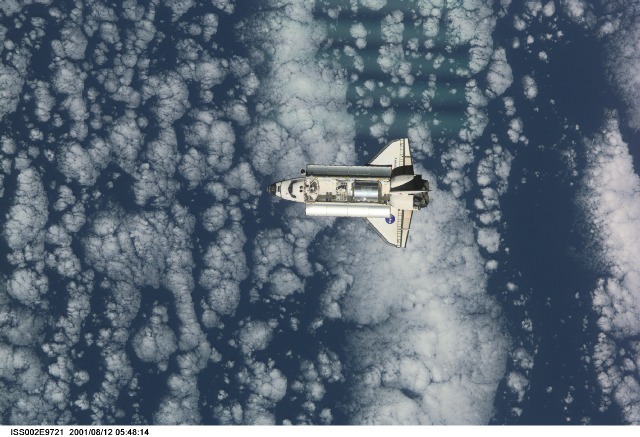 Once in space, the shuttle orbiter is home for seven to 14 days. 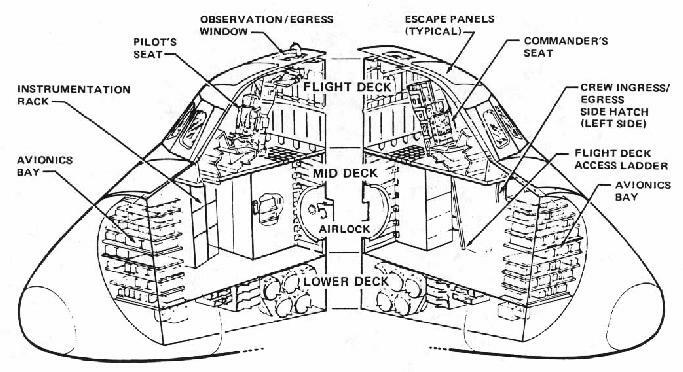 The orbiter can be oriented so that the cargo bay doors face toward the Earth or away from the Earth depending upon the mission objectives; in fact, the orientation can be changed throughout the mission. One of the first things that the crew will do is to open the cargo bay doors to cool the orbiter. 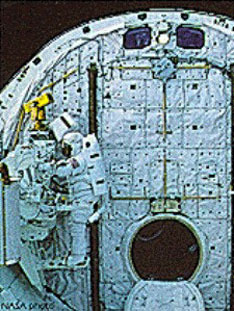 The crew compartment has 2,325 cu.ft of space with the airlock inside or 2,625 cu.ft with the airlock outside. 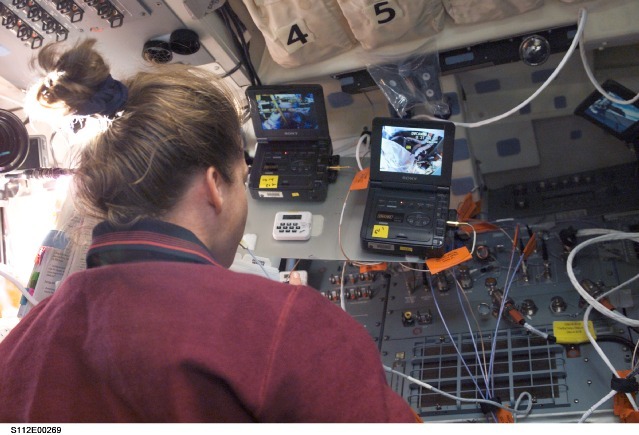 lower deck (equipment bay) - contains life support equipment, electrical systems, etc. Our atmosphere is a mixture of gases (78 percent nitrogen, 21 percent oxygen, 1 percent other gases) at a pressure of 14 lbs/in2 (1 atm) that we breathe in and out. The space shuttle must provide a similar atmosphere. To do this, liquid oxygen and liquid nitrogen are carried on board in two systems of pressurized tanks, which are located in the mid-fuselage (each system has two tanks for a total of four tanks). The cabin pressurization system combines the gases in the correct mixture at normal atmospheric pressure. While in orbit, only one oxygen system and one nitrogen system are used to pressurize the orbiter. During launch and landing, both systems of each gas are used. Chemical carbon dioxide canisters remove carbon dioxide by reacting it with lithium hydroxide. These canisters are located in the lower deck of the crew compartment and changed every 12 hours. Filters and charcoal canisters remove trace odors, dust and volatile chemicals from leaks, spills and outgassing. A cabin heat exchanger in the lower deck cools the air and condenses the moisture, which collects in a slurper. Water from the slurper is moved with air to a fan separator, which uses centrifugal force to separate water from air. The air is recirculated and the water goes to a wastewater tank. Besides air, water is the most important quantity aboard the orbiter. Water is made from liquid oxygen and hydrogen in the space shuttle's fuel cells. The fuel cells can make 25 lb (11 kg) of water per hour. The water from the fuel cells passes through a hydrogen separator to eliminate any trapped hydrogen gas. Excess hydrogen gas is dumped overboard. The water is then stored in four water storage tanks located in the lower deck. Each tank can hold 165 lb (75 kg). The water tanks are pressurized by nitrogen so that water can flow to the mid-deck for use by the crew. Drinkable water is then filtered to remove microbes and can be warmed or chilled through various heat exchangers depending upon the use (food preparation, consumption, personal hygiene). Excess water produced by the fuel cells gets routed to a wastewater tank and subsequently dumped overboard. 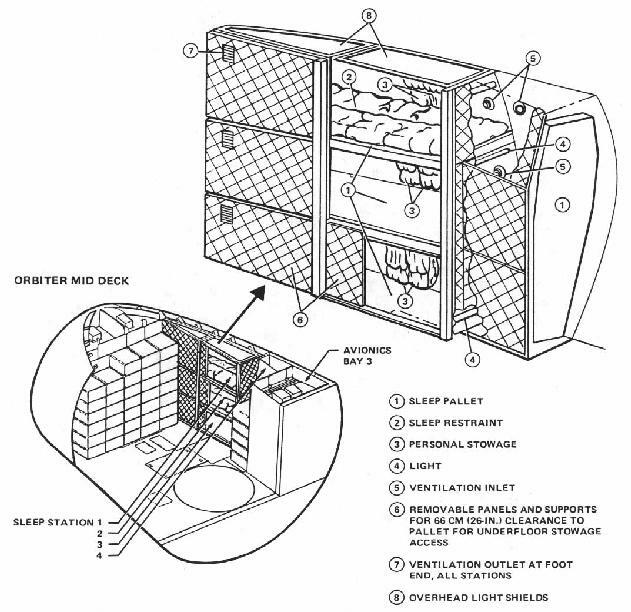 Distribute heat where it is needed on the orbiter (mid-fuselage and aft sections) so that vital systems do not freeze in the cold of space. Get rid of the excess heat. Passive methods - generally simple, handle small heat loads and require little maintenance. Insulating materials (blankets), surface coatings, paints - reduce heat loss through the walls of the various components just like your home insulation. Electrical heaters - use electrically-heated wires like a toaster to heat various areas. Active methods - more complex, use fluid to handle large heat loads, require maintenance. Cold plates - metal plates that collect heat by direct contact with equipment or conduction. Heat exchangers - collect heat from equipment using fluid. The equipment radiates heat to a fluid (water, ammonia) which in turn passes heat on to freon. Both fluids are pumped and recirculated to remove heat. Pumps, lines, valves - transport the collected heat from one area to another. 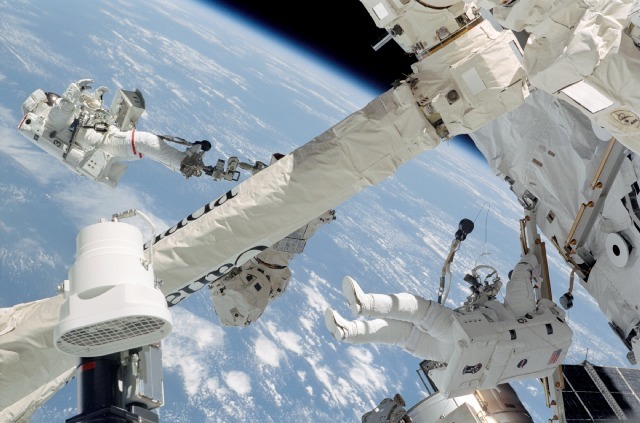 Radiators - located on the inside surfaces of the cargo bay doors that radiate the collected heat to outer space. Flash evaporator/ammonia boilers - these devices are located in the aft fuselage and transfer heat from Freon coolant loops overboard when cargo bay doors are closed or when cargo bay radiators are overloaded. Freon coolant loops wrap around an inner core. The evaporator sprays water on the heated core. The water evaporates removing heat. The water vapor is vented overboard. Freon coolant loops pass through a tank of pressurized ammonia. Heat released from the freon causes the ammonia to boil. Ammonia vapor is dumped overboard. The cabin heat exchanger also controls the cabin temperature. It uses circulated cool water to remove excess heat (cabin air is also used to cool electronic equipment) and transfers this heat to a Freon exchanger. The Freon then transfers the heat to other orbiter systems (e.g., cryogenic gas tanks, hydraulic systems) and radiates excess heat to outer space. The orbiter has internal fluorescent floodlights that illuminate the crew compartment. The orbiter has external floodlights to illuminate the cargo bay. Finally, the control panels are lighted internally for easy viewing. Like any home, the orbiter must be kept clean, especially in space when floating dirt and debris could present a hazard. Wastes are made from cleaning, eating, work and personal hygiene. 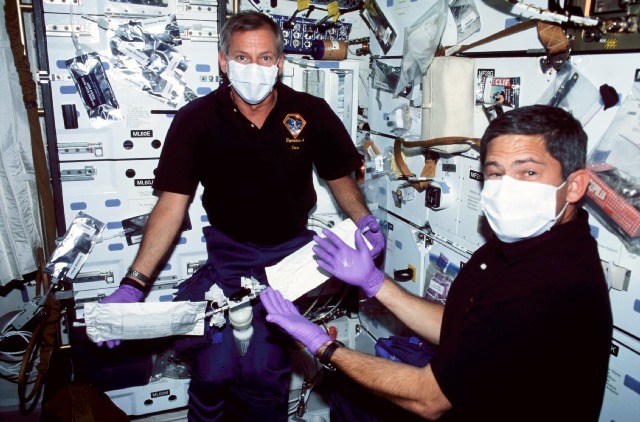 For general housecleaning, various wipes (wet, dry, fabric, detergent and disinfectant), detergents, and wet/dry vacuum cleaners are used to clean surfaces, filters and the astronauts. Trash is separated into wet trash bags and dry trash bags, and the wet trash is placed in an evaporator that will remove the water. All trash bags are stowed in the lower deck to be returned to Earth for disposal. Solid waste from the toilet is compacted, dried and stored in bags where it is returned to Earth for disposal (burning). Liquid waste from the toilet goes to the wastewater tank where it is dumped overboard. After a fire is extinguished, the atmosphere control system will filter the air to remove particulates and toxic substances. Close the cargo bay doors. Most likely, the shuttle has been flying nose-first and upside down, so the RCS thrusters are fired to turn the orbiter tail first. Once tail first, the OMS engines fire to slow the orbiter down and fall back to Earth; it will take about 25 minutes before the shuttle reaches the upper atmosphere. During that time, the RCS thrusters fire to pitch the orbiter over so that the bottom of the orbiter faces the atmosphere (about 40 degrees) and is moving nose first again. Finally, leftover fuel is burned from the forward RCS as a safety precaution because this area encounters the highest heat of re-entry. These materials were designed to absorb large quantities of heat without increasing their temperature very much (i.e., high heat capacity). During re-entry, the aft steering jets help to keep the orbiter at its 40 degree attitude. The hot ionized gases of the atmosphere that surround the shuttle will prevent radio communication with the ground for about 12 minutes (i.e., ionization blackout). Soon, the orbiter will encounter the main air of the atmosphere and it will be able to fly like an airplane. 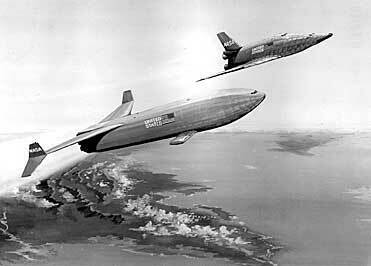 The orbiter was designed from a lifting body design with swept back "delta" wings. With this design, the orbiter can generate lift with a small wing area. The orbiter is being flown by the flight computers at this point. The orbiter will make a series of S-shaped, banking turns to slow its descent speed as you begin your final approach to the runway. The commander picks up a radio beacon from the runway (Tactical Air Navigation System) when the orbiter is about 140 miles (225 km) away from the landing site and 150,000 feet (45,700 m) high. 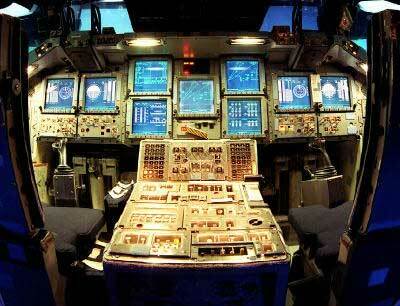 At 25 miles (40 km) out, the shuttle's landing computers give up control to the commander. 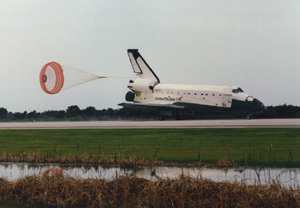 The commander flies the shuttle around an imaginary cylinder (18,000 feet or 5,500 m in diameter) to line the orbiter up with the runway and drop the altitude. During the final approach, the commander steepens the angle of descent to minus 20 degrees (almost seven times steeper than the descent of a commercial airliner). When the orbiter is 2,000 ft (610 m) above the ground, the commander pulls up the nose to slow the rate of descent. The pilot deploys the landing gear and the orbiter touches down. The commander brakes the orbiter and the speed brake on the vertical tail opens up. A parachute is deployed from the back to help stop the orbiter. The parachute and the speed brake on the tail increase the drag on the orbiter. The orbiter stops about midway to three-quarters of the way down the runway. After landing, the shuttle goes through the shutdown procedures to power down the spacecraft. This process takes about 20 minutes. During this time, the orbiter is cooling and noxious gases, which were made during the heat of re-entry, blow away. Once the orbiter is powered down, you exit the vehicle. Crews are on-hand to begin servicing the orbiter.